For my wife’s birthday, we were gifted tickets to Trinity Roots, who were playing at the Wanganui Savage Club in Whanganui. Suffice to say, they were outstanding, and the atmosphere was suitably eclectic and friendly, alcohol flowed freely and clouds of marijuana smoke wafted outside, across the front of the hall. The Savage Club was founded in 1857 in London “to provide rational entertainment and good fellowship”. The name is a joke, named after a poet of poor reputation, Richard Savage. The first New Zealand branch was founded in Dunedin in 1888. Savage Clubs are closely linked with Orphans Clubs, established by people who wanted to gain entry to Savage Clubs that were over-subscribed, consequently they called themselves ‘orphans’. 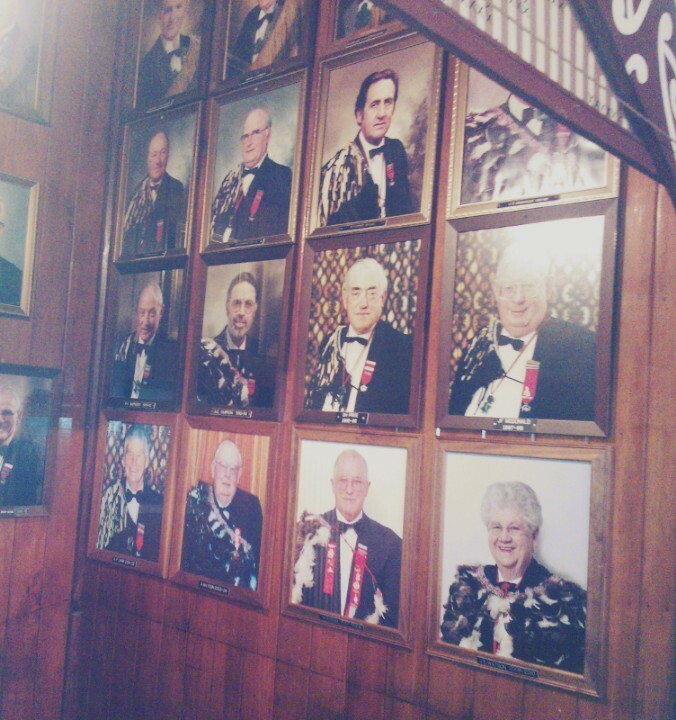 There are 25 clubs throughout New Zealand. Savage Clubs seem to focus on cabaret and revue style entertainment: skits, practical jokes, music, cross-dressing, and the like. And in New Zealand that manifested itself in a broad Orientalist lampooning of Māori cultural practices in all aspects of their club. Coat of arms included poorly represented Māori warriors. The Napier Savage Club warrior was chewing on a human femur. 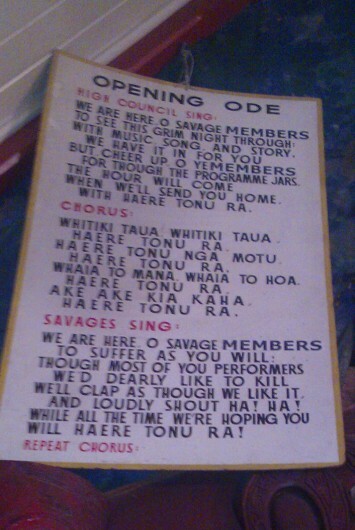 The Ode is an interesting Monty Python-esque song with Māori verse (as seen above). The president is known as the Rangatira and is presented with the club taonga, a korowai. The clubs have haka parties who welcome guests, dressed in piupiu, poorly represented moko and holding a variety of Māori weapons. 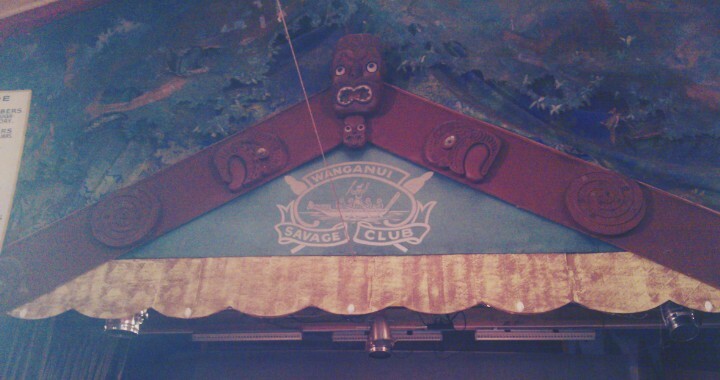 The Wanganui Savage Club is in a hall that is done as a crudely presented marae. Visiting another club is called a raid. And the members are, almost to a person, Pākehā. 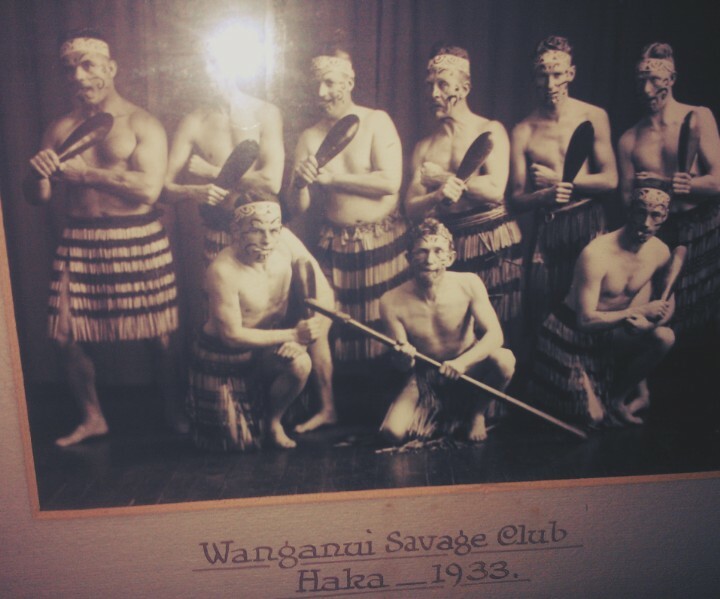 The Wanganui Savage Club is our very own Tikitiki Bar, an Orientalist fantasy that provided a testosterone filled chance for men (and latterly women) to dress up as savages, to play act with their projection of the freedom of Māori society. In one sense it feels like a harmless chance to play. On the other hand, it is a crude appropriation of an entire people. I was overwhelmed, amused and offended. And I really believe it is something that we shouldn’t let fade into nothingness. It is another strand in the development of our relationships as Māori and Pākehā. If you are in Whanganui, it is definitely worth a visit.